There is a series of books titled, “Plain & Simple, The Only Book You will Ever Need”. I have three of these that I would like to review together, in that they are part of a growing series. The first one I will review is “Chakras, Plain & Simple” by Sasha Fenton. The book begins with an introduction to the chakras, what they are, and how they work. From there, there is a chapter on each chakra with description, purpose, benefits of each when healthy and each includes an exercise for the specific chakra. How to heal your chakra is next discussed, bringing them into balance using colors, crystals, oils, altars. The last two sections go beyond the 7 major chakras to the minor ones and a very short discussion on kundalini energy. The next book is “Flower Essences, Plain & Simple,” by Linda Perry. It follows the same formula, starting with what they are, how to choose them, feel their energies and how to make them. It describes how to use them with the chakras and the subtle bodies. There is a small section referencing Dr. Edward Bach, found of Bach Flower Remedies, and then moves into a discussion of different essences including, but not limited to, rose, lavender, eucalyptus, and red geranium. It ends with a glossary of essences and their uses, including how and when to use them. We finish with “Herbs, Plain & Simple,” by Marlene Houghton. Ms. Houghton starts us off with a history of herbalism, how it is used in healing and the use of a “green pharmacy”. This is followed by a section on herbs for individual body systems, including, the immune system, digestive system, nervous system and more. It discusses what you would put in an herbal first aid kit, medicinal honeys, different herbal elixirs, including herbs for anti-aging, herbal teas and the comfort of herbal baths. While I would not quite agree that these are the only books you will ever need on these subjects, I do agree that they are “Plain & Simple”, giving you the basic information you would need to know before deciding whether or not to delve further into any particular area of interest. Ms. Cockram has written a very informative book. There are 16 chapters spread out over 160 pages. One of the first things that Ms. Cockram includes that I have not seen in a lot of other books that speak on Crystal energy is the Mohs scale. I like the fact that she added the Mohs scale because it allows you to see the hardness of specific crystals, and from there you can find out what the Mohs scale is for your crystals. Another graph Ms. Cockram includes in the first chapter is a Crystal colors and properties. You’ll find as you go through the book that this graph matches the crystals as she explains their energy. From chapter 2 to chapter 12, there is a lot on Crystal healing, Crystal energy, Crystal grid work, and the chakras. In chapter 8, Ms. Cockram talks about the chakras systems in the crystals, I like all of the different crystal suggestion she gives for each chakra, and she even covers the minor chakras. I like the different crystal grids that she gives on pages 86, 87, 88, and 89. There are other grids that she talks about before that, but those are more well-recognized crystal grids. In chapters 11 and 12, Ms. Cockram gives precise instructions on working on yourself with crystals and as well as others. One of the suggestions she offers that I think is neat and is excellent for larger groups, such as a yoga class. Have everyone write their name down on a piece of paper and take their place on the yoga mats. And then Ms. Cockram says to put all the names on the pile and surround the pile of names with crystals. I find this interesting because I often work in large groups doing healings, and this allows you to use crystals, without having to buy an exorbitant amount of crystals. In chapter 13 Ms. Cockram starts covering divination with crystals. If you are beginning to study astrology or if you are looking for new ways to do divination this chapter holds some wonderful insights to help get you started. Not only does she give the astrology signs, but she also provides some crystals that would work well with the astrological signs, not just the birthstones. Also, in chapter 13, Ms. Cockram covers using a magic square with crystals, from Feng Shui. Ms. Cockram in later chapters covers meditating with crystals, working with intentions with crystals, correspondence of crystals, including numerology. For only having 160 pages. Ms. Cockram packed a lot of information into this book. If you are starting on crystals, yourself, or you have a friend who’s just beginning their journey with crystals, this is a very informative book to own. **Now… For your chance to win a Free copy of In Focus Crystals: Your Personal Guide by Bernice Cockram this month through PaganPagesOrg, thanks to the Quarto Group, visit PaganPagesOrg Instagram hit follow, find the picture promoting the contest of In Focus Crystals: Your Personal Guide by Bernice Cockram posted and leave a comment! That’s all!! A winner will be randomly chosen on Monday September 17, 2018. USA & Canada Only. Paola Collazos is a Reiki master, energy medicine practitioner and a licensed massage therapist. She is also the author of “We Are Magical Beings”. I had the chance to not only review the book, but also talk with Paola recently. Deanna-In your book, We Are Magical Beings, you share the hardships that came with your childhood. You seem to have blossomed from that childhood once you found energy work. What would you say to your younger self? Paola-To my younger self I would say I promise to nurture you and keep life light- hearted and fun. D-Do you believe you would be where you are now, if you had experienced a different childhood? P-I would for sure be somewhere else had my childhood been different. Our early experiences shape our personalities and decisions profoundly. But I wouldn’t trade my childhood, it was filled with lessons and I love myself the way I am today. D-In today’s world, we are seeing a lot of high profile celebrities who have depression that are committing suicide. What would you recommend to someone that is dealing with depression? P-The thing about depression is that you have to catch yourself before you fall, and for that to happen one has to choose to be aware of the triggers way before you catch yourself falling. BUT before wrapping your mind around that last statement, one must accept, and absolutely know within themselves that they are not alone, 44,965 Americans die by Suicide each year. The numbers show it, you are not alone. Even, I, with all the tools, experience lows sometimes. If you need to take medication then do so without judgments but do the self-work. Watch your self-talk. Eliminate self-judgment and get to know your triggers, avoid them at all costs by keeping busy, work hard, volunteer, exercise, take walks, see friends, perhaps get a pet and breathe. Repeat, every day, and in every moment, that you can remember. D-During your first Reiki session, you describe an emotional session that seemed to be a turning point for you. Do you feel that you would have reacted the same if the woman had not started crying? P-I do. I feel that if the woman had not started to cry I may have been more open to energy the first time around. I have learned that with energy work people tend to be skeptical or perceive it as mumbo-jumbo therefore it is vital for the practitioner to be clear, professional and as informative as possible. D-This book is packed with information on tuning into the energy that we are. For someone who might get overwhelmed easily, where would you recommend getting started? P-They should find a comfortable quiet space, lay down, close their eyes and notice their breath, then they should notice their heart beating. Tune in to the simple things in life. Revel in the mastery of the human anatomy. D-During this journey you went through a natural detoxing where your body’s chemistry started changing. You had a difficult time finding a deodorant that worked and you stopped enjoying the taste of meat. In your experience, is this natural detoxing a normal part of the journey for everyone when doing energy work? P-This varies by person. It is different for everyone. One can even experience this natural detoxing by merely starting a yoga practice. So yes, it is a normal part of the journey. D-After getting your Level One Reiki Certification, you waited a year before getting your Level Two. Would you recommend this same wait time for someone who is interested in obtaining Reiki Certifications? P-Yes, I believe that one should take the time after level one to heal themselves before they start trying to help others however some people get both attunements and even the third all in one weekend. I’ve also heard of Masters not passing on the second attunement until years after the first. For me, it depends on the student but I would encourage some time to explore their own chakras after the first level. There is a lot to explore within oneself and things start to shift. So, you want to be respectful and allow yourself the time to process. D-Also, after waiting a year, were you able to obtain the Level Two Reiki Certification with the same Reiki Master that certified you as a Level One Reiki? P-The First Reiki Master did my second level. The level three was done by someone else years later. D-For someone who is serious about learning all there is to know about energy work, would it be more beneficial to study one area of energy work (Reiki) before moving on to something else? Or can different areas of energy work be studied and used at the same time? P-Yes, they can be studied at the same time but it also depends on the person and their learning style. It also depends on what they are planning to do with the information. Are they curious for their own healing or if they would like to teach/work on others? The energy systems are the same all across the board what changes are the ways in which the individual chooses to tap into the energies to keep them settled. One can get started with learning about chakras without having to get Reiki attunements however it does not hurt. It will certainly give you a boost. When I got my first attunement the master provided me with a lot of information that I wouldn’t have known by merely researching chakras. Like that KAVA tea has spirit unifying properties and that it would help me with lucid dreaming. Once you get started with energy work things will unfold and one thing will lead to the other. The Meridians or (energy channels) and five element theories are a little more complicated to understand and to apply and I only delved into that in massage therapy school however I do not think it is impossible to grasp. I tried my best to simplify these concepts in my book because I do believe it is necessary to understand. Think of the chakras as the Macro and the Meridians as the micro. Chakras governs the muscles, organs, veins, and ligaments within the chakra’s vicinity. They are super busy hubs of energy that receive and give out information. They also contain information about your life’s journey while the meridians are energy pathways that pertain to one specific organ. And yes they can be used at the same time. D-‘We Are Magical Beings’ contains many different areas of energy work. Out of Reiki, Meridians, Chakras, Auras, Yin and Yang, Elements, Centering, Inner Child and Visualizations; do you have a favorite energy work? P-Picking one is hard because they are so intertwined. I do love visualizations and I think that visualizing and or tapping into the imagination is crucial for all of this work. So, visualizations are my favorite. D-One of the quotes from the book is “There is perfection in imperfection!” This is very powerful. In today’s world it seems that we are constantly chasing perfection. This quote feels as if it is giving us permission to be who we are without worrying about perfection. Did you find it freeing once you rid the notion of being perfect? P-Yes, allow yourself to be imperfect. Try your best but be clear about your process. Be mindful that you are not using this idea of perfection to procrastinate and not proceed with what you want. Remember the mind would much rather be safe in its routines so it will always convince you that you are not there yet. It was freeing for me because I allow myself to have fun and try new things. I’ve heard so many people say they won’t try new things because they are not “good” at it. Allowing yourself to be imperfect is very freeing. Thank you so much Paola Collazos for taking the time to talk with us at PaganPagesOrg! If you would like more information on Paola Collazos visit her site at: http://www.paolacollazos.com/ or you can find out more about her book We Are Magical Beings by clicking the links or the book cover below. Enjoy!! We Are Magical Beings is a book written by Paola Collazos, LMT. It is published by Balboa Press, a division of Hay House. Paola Collazos is a Reiki master, energy medicine practitioner, a licensed massage therapist and now, a published author. We Are Magical Beings takes us on a magical journey. First through Paola’s life and then through the journey of energy work. While this book is not an autobiography, we get a glimpse into Paola’s life starting with her childhood. We see how situations and experiences can shape a person and affect, not only their life, but also, their energy. This made me rethink my life, the situations, and experiences that I have been through. I can see how life has shaped me into the being that I am today. But I am a magical being, that can change the energy that is going on in my life. “The body is a wise self-healing structure”. We Are Magical Beings goes over numerous different areas of energy work. Paola not only explains the different areas of energy work but she goes into detail on how you can incorporate these practices into your daily life. Some of these areas of energy work are chakras, meridians, auras, yin and yang, along with the elements. Paola explains why it is so important to treat our bodies like a temple and to keep our thoughts pure. “I am talking about the wars that exist within our minds, the ones that some fight with every day in order to get by with ease”. This statement helped me realize that I am not the only one who battles with their thoughts. It also makes me (and anyone who reads this book) realize that we can change this mindset! Paola is able to explain how the body and energy work together. She explains this not only in Yin and Yang but also in the meridians and the elements. It’s amazing to read how these energy systems control the different areas of the body. She also explains how we can use our thoughts and yoga poses to put these areas back into balance. One of my favorite chapters talks about the perfection that comes with imperfection. I have dealt with anxiety my whole life. I have always been a perfectionist and when I cannot reach it, I suffer mentally. I was amazed to see that the imperfections in my life are truly perfection. “Believe in yourself, have fun, and don’t be so hard on yourself”. This statement has helped me release some of the anxiety. For once, I am able to live without worrying about being perfect. I shared this book with my skeptical mom. By the end of the book, she was asking for more reading material on this subject. Not only did this book help her see a new way of living but she has been able to incorporate energy work into her daily life. Her health has been improving and I truly believe that “We Are Magical Beings” started it all. I would encourage anyone who is curious about energy work to pick up this book. Give it a read, practice the exercises and incorporate the energy work into your daily life. Personally, I love mudras; they are such a simple way to heal, both physically and emotionally. The mudra book that I currently own is in pieces, and so this one coming to me is doubly welcome. Part I explores the “concept” of mudra, which, simply put, is yoga for your hands. Ms. Herschi introduces the mudra, its’ possible origins and how and when to practice them. This includes how the hands themselves correspond to the chakras (energy centers in the body), Ayurveda (the Indian art of healing through food, acupressure, reflexology using the hands instead of the feet and meridians (energy paths). Part II, which is the bulk of the book, introduces the mudras themselves. The author describes how to hold the hands for each mudra, the issue for which the mudra is being used, how to use the mudra in combination with pranayama (breathwork), asana (posture), plus movement. Each mudra also lists an herbal remedy that can be used for the specific issue being worked on, as well as an affirmation. There are 52 different mudras presented within the book. There is a short section toward the back of the book which describes different mudras that can be specifically used in easy pose (cross-legged seating) and some that can be used with specific movements. The book closes with several appendices, as follows: Nutrition, Herbs, Chinese Five Element Theory (wood, fire, earth, mental, water), and very basic Chakra information. If you are looking for an easy way to begin healing or to add meditation to your daily life, this book would be a great way to go about doing so. I can easily see myself reaching for this book when looking for something specific. There are many people who would not include the aura as an 8th chakra, however, within Kundalini Yoga, it is included as such and so I include it here. While they are separate from each other, I find that they go together very nicely and I have always taught them together. The Seventh Chakra is the Crown Chakra. It’s name in Sanskrit is Sahasrara, which means Thousand-Fold. Its’ color is violet. It has no specific element as it is everything. If it were to be given an element, it would be “thought”. It is located at the very top of the head. The function of the Seventh Chakra is knowing and enlightenment; a surrender and connection to a higher consciousness, the infinite. When this chakra is balanced and functioning properly, you will be blissful and joyful. You will find that there is a balance in your life, as you will be guided by a higher power and feeling the presence of the Divine, as you will be connected to it. You may find that others are drawn to you and you may feel the need to teach what you have learned. Conversely, if this chakra is unbalanced, you will be filled with doubt and depressed. You will be concerned only with the physical and shun the spiritual. You will be very practical and may have a fear of the unknown. You may find yourself being apathetic about the issues going on around you. Sit in easy pose on the floor or, if more comfortable, on a straight-backed chair. Lace your fingers together and bring them behind your neck. Very quickly raise your arms above your head, keeping the hands laced together, and then bring them back to the original position behind the neck. This should be done with a very powerful breath, through the nose. Do this for 3 minutes. powerful movements. Do this for 4 minutes. You can also do this beautiful breath exercise. Bring your hands into prayer pose, crossing the thumbs, and holding them over your head. Close your eyes and roll them up to focus on your crown, as if you were looking out the top of your head. Breathe long and deep for at least 3 minutes to a maximum of 7 minutes. Now sit quietly. Visualize a funnel at the top of your head and a shaft of golden light filled with energy streaming in. Feel this energy penetrate and open the crown of your head, illuminating it and then expanding to fill and free your throat, the back of your neck and shoulders. Bring the warmth to your heart, let it shine in your solar plexus – pump your navel for just a moment and expand your abdomen. Let it spread to your sacral area and connect to the base of your spine, down your legs and reach deep into the center of the earth. This is done with long, deep breathing. Lie down on the floor and relax for at least five minutes or alternately, sit quietly with a relaxed breath. Stretch your arms up toward to ceiling several times before moving. As it is the Seventh Chakra that helps us to connect to our higher selves and the Infinite Divine, it is the gateway and guide to the Eighth Chakra. The aura as the Eighth Chakra has no name in Sanskrit that I am aware of and no element. Its’ color is white. This chakra is the electro-magnetic field that surrounds the entire body. The aura is the energy center of love and spiritual compassion. If we open all of our chakras and strengthen the aura, then we will be radiant, fully aware of our higher power and aspirations, fully connected to the Infinite. We have moved up from the Root to the Crown, opening and balancing each in its’ turn. The Kundalini energy is moving freely throughout our bodies, and so this energy finds its’ beginning and its’ endings within our aura. It is the totality of who we are. When trying to determine your aura, think of what you consider to be your personal space, how close others can come to you before you start to feel uncomfortable. This differs from person to person. In this way, you can think of the aura as your personal protection. As you strengthen the aura, it will become stronger, so that not only is it our protection FROM the world, it also becomes your projection TO the world. When others say we appear strong and confident, this is the projection of a strong aura. The aura is the Beauty of the Soul. The aura can be strengthened with any exercise that moves the arms around the upper body, i.e. a jumping jack without the jumping. From a standing position, feet shoulder width apart, close your eyes, inhale and bring your arms sweeping up, allowing the palms to meet briefly. Exhale and bring them back down. You can also swing your arms out to the side, parallel to the floor and twist from the waist. As you sit quietly, meditate upon the glow around your body. With each inhale, expand the glow further and further from yourself. Use the breath to add energy to it. With each breath, keep expanding to fill the room you are in, and then beyond to the outside world, continuing to the sun, the moon, the stars, the Universe. If you wish, you can add the different chakra colors to it. When you feel you can continue no farther, start to bring it back until it is once again your own personal glow. Remember to lie down and relax completely when you are done with this visualization. Take deep breaths and allow yourself time getting back up. I wish you peace, joy and a happy, blessed New Year. The past few months, we have been talking about meditation, it’s benefits, the why’s, where-for’s and how-to’s. In Kundalini Yoga, the yoga that I teach, we move toward systematically raising heat and energy through our bodies and up our spines through use of the chakras. The word “chakra” means “wheel” in Sanskrit and are the energy centers within your body. These chakras can be blocked by long-held stresses, tensions and other factors. Meditation is key in helping to release these blocks. If you have a grounding exercise that you prefer, then by all means, please do that one. Over the next few weeks, I will discuss each chakra in detail, with meditation suggestions and ideas, but this month will be an overview of the main eight (most traditions will say seven, but within Kundalini, we count the aura as the eighth chakra). Until next month, I wish you love and happiness. The Chakras is a Sanskrit word the means wheel or disc. This was deciphered and used to help people find themselves. The Chakras was modeled after the Kabbalah from the Crown to the Muladhara, or the root. In the kabbalah it is equivalent as the Kether to the Malkuth, which means the crown of the tree of life to the physical plane. The physical plane is also known as shekniah, or the female aspect of god of which we live in kabbalistic terms. The chakras is very interesting in the fact it points out the way to enlightenment is retained in us if we allow ourselves to find truth. Each Chakras has a body part to which it has an association. You can google the chakras and find exactly where they are located. The focus on the Chakras is for meditative purposes and helps you focus on who you are. The Aura comes from the chakras and there are seven chakras in the body. Once you understand the Chakras it will guide you into the Kabbalah and you will see a great resemblance. When this Chakra is open we feel a sense of belonging. This Chakras lets us understand our basic needs of food, water, shelter and ect. This Chakra also helps us feel in touch with our bodies. 2. Svadhisthana, or sacral and glows orange and spins around in our abdomen below the naval. When this chakra is opened is associated with health, pleasure, feelings, and sexuality. When this chakra is opened up and balanced we feel abundant we know we are deserving of these pleasures in life. It Helps our emotions flow through our lives taking them as they come knowing they will pass. Emotions are fluid, as is life. When we find ways to express our emotions we are able to keep our emotional and physical bodies well. 3. Manipura, or Solar Plexus and is a bright yellow ball that heats up our personal power and is located at the solar plexus. The manipura helps us center . This is where we develop the sense of autonomy and a sense of self. When this Chakra is open we well worth of what life has to offer us. We realize the power we use to process to create the life of our dreams is already alive inside of us. When we find out how to harness this energy we find the strength to conquer dreams and goals. When we open up this Chakra it creates Balance in our lives. Once we open this Chakra we feel compassion to ourselves. Once we know how to be kind to ourselves from an understanding, considerate, and peaceful place it connects us to others, surroundings, and the universe. When we tap into this Chakra love radiates around us and into the world. 5. Vissudha, the throat and a blue energy of truth which spins in our throat helping us to be authentic in the way we live our lives. The throat is where we communicate, where we are able to share our view. Part of speaking truth involves carefully choosing our words. This does not mean we bottle up words, but try to look at all perspectives and be respectful with the presentation of them. 6. Ajna, third eye and a violet light which makes it?s mark on our forehead between the brows and slightly above. This is the third eye and when we need focus Ajna helps us seek guidance . This Chakra helps us realize what we need is inside of us. This third eyes helps us answer questions in life. 7.Sahasrara, the Crown and this is a bright white light which shines above our heads as it radiates upwards, its rays reach the worlds above us. As we ground ourselves this chakra helps us accept change in the world. Once we accept the change of the world we can build a strong sense of self, knowing we deserve to fulfill our dreams. Having learned to love thyself we can learn to love others. Then we are able to speak with truth with integrity involved. We are able to be open and honest and listen to the inner voice. Going on this journey we feel alone, but we are all connected. The white light blends into the light that flows from other beings. We are one. Merry Meet and welcome! I am so glad to have each of you as readers to this column and as promised we are going to discuss the chakras in this edition. I must admit that after a great deal of thought after writing the first portion of this (Grounding and Centering) that I found myself debating about whether or not I should have included this portion in that posting. Ultimately, I am not sure if I left people confused or not, but I didn’t get any e-mails either so that may mean that things are alright! If you are a reader I would love to hear from you as input is always a wonderful thing and suggestions are always welcome as well! However, we shall move on with the topic at hand and get into some greater detail on each of the seven chakras as well as the colors associated with each. Oddly enough we do not start with the chakras at the top of the head and rather at what is referred to as the “root” and move on from there. Since there are seven chakras to cover, perhaps we should first develop and understanding what a chakra is. A chakra is most clearly defined as an energy center that runs from the root of your spine (sacrum) out the top of your head. In the Hindu belief system, the Kundalini works directly with these energy centers and produces a powerful type of sensation. I highly recommend that some time is dedicated to researching this aspect of using the energies of the chakra centers as well as it is not only quite informative, but exhilarating as well the first time you experience it! 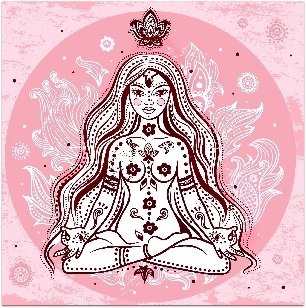 Since Kundalini is a bit more complicated, we are going to focus on the chakras as this is less complicated and above all less complicated energy work. The first chakra that we are going to focus on is going to be what is known as the “root chakra” or muludhara. Generally, this is the first chakra opened, but this is of course open to discussion among many groups and I often elect to open this chakra last. However, I also open them all and then work toward grounding and centering with the energies running upward toward my crown chakra. Since (as far as I know) there is no specific sequence to this, go ahead and start in whatever order you feel most comfortable with. This particular chakra is usually visualized as a deep red color as it is being opened. As you gain experience with your chakras you will be able to tell if they are glowing, dim, and even harboring some negative energies. This will all come in time of course, but useful when trying to meditate and clear out those pesky energies that we don’t want! I prefer to visualize a spinning spiral of sorts when opening the chakras, but there are many other ways to do this as well. Two that I can think of are: an opening door and a blooming flower. I have used both and actually use a spiral to open my own and a closing door to close the chakra. Now, since I have rambled so much on this topic…lets get down to what this chakra symbolizes. The most basic of needs such as food, water, and shelter are often needed for this chakra to feel balanced. However, there are other “needs” that do not include these physical things that this chakra represents like balance within our own lives. An example of this would be that this chakra represents vitality, courage, and self-confidence. Delving deeper we find that this energy center also helps with the kidneys and bladder, the vertebral column, and hips and legs. Many issues that we have medically in regards to these areas can also be focused upon with meditation and the use of this particular chakra. In the end, this chakra helps represent the balance within yourself as well as a connection to the earth. Our second chakra energy center is known as the “sacral” chakra and is generally symbolized with the color orange. This chakra can be found in our lower abdomen just below the navel and is symbolic of sexuality, health, feelings, and balance within our own lives. It is when this chakra is balanced that we truly feel that we are enjoying our lives and getting all the things that we deserve. Through this recognition of the ability to express emotion, we find not only our mental health, but physical health improving as we work toward a better relationship with this chakra center. Going along with this chakra we will move onto the third chakra, the solar plexus. This particular center is viewed as a yellow ball of fire and is symbolic of our growing personal power. What makes this chakra the most important is that this center is where we learn about ourselves and continue to develop into the person that we wish to become. Through the energy in this chakra we discover that we as people possess the energy to make our dreams a reality and all the tools that we need are actually deep within us. As with most things we must learn to use this energy and practice awakening the gifts that we have deep inside us. The fourth chakra is known as the heart chakra and is usually viewed as being a green center of light and is synonymous with our own internal balance more than any of the others. What is important about this chakra is that we must first learn to love ourselves and then we can actually learn to love others. Where I found this difficult is that this chakra also takes the brunt of many things that occur emotionally in our lives. If you take a little bit of time you can view this chakra and see if it is glowing bright green or a dulled color. This can be representative of negativity lingering and a simple clearing of this chakra can not only help resolve the problem, but strengthen your understanding of this energy center as well. One unique fact about this chakra is that as the heart it not only provides us with life, but can also help in the strengthening of our immune system as well. The fifth, sixth, and seventh chakras are all located in the region from out neck to the crown of our head. We will first take a look at the throat chakra (5th) and what some of the attributes are with this particular energy center. Since we use this area in our physical lives, it is logical to assume that this center would be directly connected to our use of speech and how we address others. The goal here would be to not only speak wisely, but to also keep in mind that which is being said and the effect that it may have on others. Master this technique and you are well on your way to dealing with this chakra that tends to store up words that are not said to others. Our sixth chakra is known as our third eye and is located within the area of our forehead and symbolized by the color violet or purple (depending on what you read). It is during the times where we are most uncertain about the clarity necessary in the decision making process that we can turn to this chakra. After all, all the answers that we seek are inside of us and all the wisdom necessary to make a decision has been there all along. The challenge is learning to listen to it! Our last chakra (crown) is generally symbolized by bright white light. 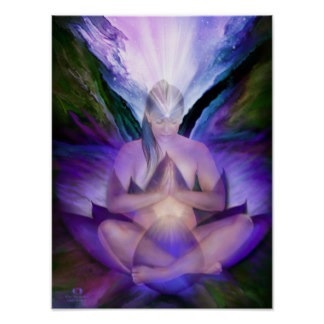 However, as mentioned with the other chakra I have also seen this described as being violet or indigo in color. Make the choice that feels the best for you as in the end you are the one seeking internal balance and wisdom. With this chakra we find ourselves learning to attune to the energies that are all around us and much like the heart chakra, we can learn to project those energies of love and light to not only ourselves, but others as well who may be in need of our help. While I have provided an overview of these wonderful tools that we have at our disposal, please keep in mind that this is only a generalized description. There are many wonderful books out there that will not only discuss the chakras in great detail, but will also provide some wonderful meditations to go along with the text. In my opinion this is a great way to learn and through practice the results will come flowing to you and the surprise will be not only wonderful, but appreciated.